Though one is nearing the end of his life and one is just beginning, this grandad and grandson share not only a bond, but near-identical zipper scars. 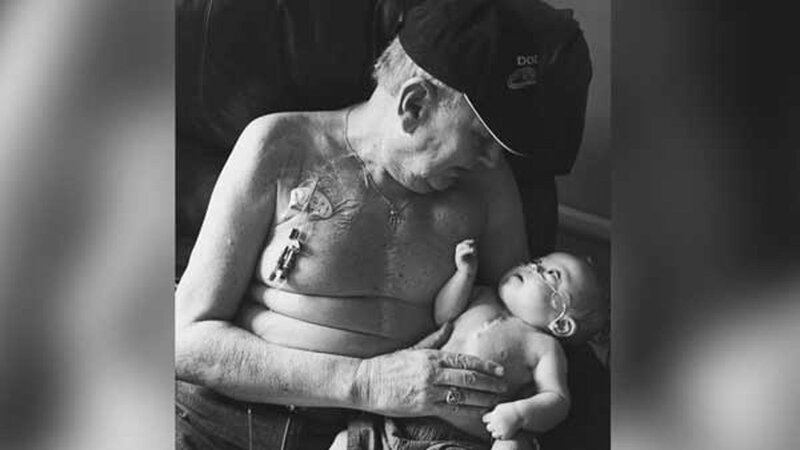 The picture, taken by Sunshine Moody Photography, is of 11-month-old Kolbie Gregware and his grandfather, Allan Halstead. Kolbie had open heart surgery when he was four months old, his mother Brandy Gregware told ABC News. Her dad had his first heart procedure 12 years ago. Gregware wanted the photo of her son, who has a twin brother, Kash, and his granddad because she isn't sure how much longer her father will live. "The medication he's on has his heart functioning at about 10 percent," she said. "Once it stops working, that's it." In addition to her father's prognosis, Kolbie hasn't been out of the hospital much since he was born. "He's been on ventilators and oxygen," Gregware said. She said Kolbie seems to have a special bond with her dad, who she calls "a real character," already. "It's amazing to watch Kolbie look at him. It's like he's looking at God. Kolbie could stare at him for hours." Photographing her dad and son's "matching zippers," as she calls them, was something she wanted to do while she still can. The photographer, Sunshine Moody, had a baby in the same NICU where Kolbie has been recovering. She became aware of Kolbie's story through a mutual friend and offered to take the photos for free. "The time came to do their photo, and for me I wanted it to be sweet but also real," Moody said. "I wanted the rawness of the situation to come out but also the sweet moment they locked faces and he spoke to Kolbie." Moody said she began her photography business in 2013 in order to capture her own baby's moments. She offers affordable photos to everyone, she said, because "everyone deserves" to have memories of their babies -- memories she herself missed when her daughter was born weighing less than 2 pounds. "I'll admit I was scared to be trusted with such a powerful photo," Moody said. After she took the pictures, she looked through the options that night. "I pulled out my computer and scrolled through and it immediately caught my eye. It was the first one I edited. And I spent over an hour on it alone." While Kolbie's twin Kash will go with "whoever will come get him," according to Gregware, Kolbie reserves his affection for just a few people, including his grandfather. And granddad feels the same. "That's his baby," she said. "He absolutely loves Kolbie to no end."